Update 12/5: this deal is dead, the Moto E is back to its regular $99.99 price. For deals that are currently live see PrepaidPhoneNews' 2014 Cyber Week Prepaid Phone Deal Tracker. One of the hottest Cyber Monday deals was the Straight Talk Moto E Android phone on sale at Walmart for just $9.99. The regular price is $99.99 so needless to say the deal sold out quickly. Walmart also canceled many orders for exceeding an undisclosed two phones per customer limit. 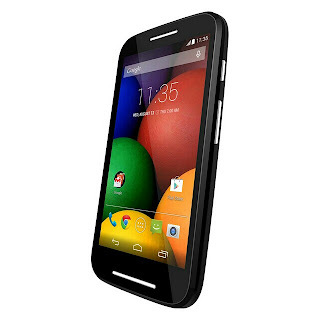 Today the Straight Talk Motorola Moto E is back at Walmart for $9.99. It does seem to have been going in and out of stock all morning so if it comes up OOS for you keep trying. Also be sure not to order more than two phones or your order will be canceled. The Straight Talk Moto E runs on the Verizon network. Specs (below) are not bad for $100, let alone $10. Although it's by no means a sure thing, some users have been able to activate the Straight talk Moto E of Page Plus. The non-removable battery, though. makes it a throw-away; a burner. Good for a disposable phone. The micro-sd is great to have. Or a steal for somebody who needs a decent phone for a steal, and Verizon to boot. I assume marshmallow will arrive to it so storage will be more flexible. A burner? A throw-away? lol. what are you talking about. So the iPhone and S6 are burner phones because they don't have removable batteries? lol. I've owned several smartphones since the first iPhone in 2007, some cheap and some flagships, some with removable batteries and some without.. and I never gave the batteries a second thought and never had any problems. I still have half of them and they all work and I've never changed a battery. "So the iPhone and S6 are burner phones because they don't have removable batteries?" Any GSM version that is unlockable, this or other for $10? Can you link to users who put on pageplus? Here's one confirmed working on Puppy Wireless. This one's for PagePlus but it's not clear if it's just speculation or if someone actually tried it. But if it works on Puppy which uses the stricter whitelist rules it should also work on PagePlus. Verizon CDMA will be around until at least 2021. All that's happening now is that as more data traffic moves to LTE, Verizon is shifting excess EVDO spectrum to LTE. But neither the Moto E nor the new Moto G support LTE. Verizon still has over 60 million customers still using 2G and 3G phones. Those customers need quality up to date phones. Not everybody is looking for or wants LTE. SIM size micro? I thought this was an CDMA phone without LTE? You're right. SIM info was a copy/paste typo. Hey, take a look at this link which someone recently posted on Turk Forums regarding TracFone's BYOP and 4G LTE phones. What do you all make of this? Does any one have any insights? . . . Dennis?? Thanks, Dennis, for your prompt reply! Your background information helps me orient myself. If I see or hear anything more, I'll let you know. Managed to get two before they sold out, thanks Dennis! Reverted by to $99 this morning. Yea I was checking all day yesterday after I saw this article. It kept saying out of stock. I find it awfully coincidental that they are back in stock today at regular price hmmm. I even had a family member go to Walmart and they had some the problem is Walmart only matches competitors prices, but they won't match their online specials. That is stupid. They should match their own website. I was going to buy 2 or 3 of them then flip them in FB sales group and make at least $50 plus profit off each one. Complaining about not being able to flip the phone isn't really a cogent argument for changing the way they run their specials. Anyway, I was able to PM the price of the AT&T Tribute last week because (according to the manager) it was in stock. They won't PM an item if it isn't actually in stock at walmart.com. Does it work on Selectel ? The ST Moto E has been reported to work Puppy Wireless so I think there's a good chance it will work on Selectel. I haven't heard of anyone trying it, though. If you have the phone and it's not already activated, contact Selectel or one of their dealers, give them the MEID and let us know what they say. Success getting this moto e on pageplus. Need to check data later though.